for all your stories, Ray. This makes me sad. The only other author whose passing has affected me as much was Robert Heinlein's and I was much younger when he passed and I knew far less about him. 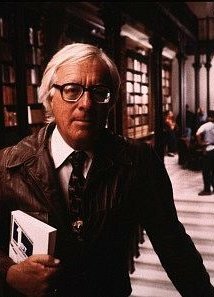 Bradbury has been as much teacher as he was entertainer for me. His influence on me came from reading about how he approached his work and then reading those works knowing how he did it. I understood his sense of wonder and I have tried to hold on to my own as I've aged. He didn't make writing a mystery. He celebrated it, told those of us so inclined to tell stories that we should go for it. Every interview on TV he always had this look of "I'm having the time of my life and don't you wish you were, too?" I realize this sounds like I knew the man, but I didn't. I was never fortunate enough to meet him, or correspond with him, nor even see him speak in public. Instead I read his books and stories and watched his TV shows and learned about capital-S Story. Dandelion Wine, The Martian Chronicles, Something Wicked This Way Comes, Fahrenheit 451, all the radio plays he wrote, everything had an effect on me. I had a Bradbury phase that lasted a lifetime. I watched the NBC miniseries of Chronicles (starring Rock Hudson and featuring Nicholas [Spider-Man] Hammond and Darren McGavin and so many other quintessentially 70s stars) as a child and then again recently as an adult. The story is still great even if the execution leaves a lot to be desired. His other TV work, the Ray Bradbury Theatre, was a child of its time and missed as often as it hit. After reading, watching or listening to one of his stories, I wanted to write. That's what I'm going to do now. I'm going to tell a story that I hope would make Ray proud. I'm going to miss him but having his stories to read will help.